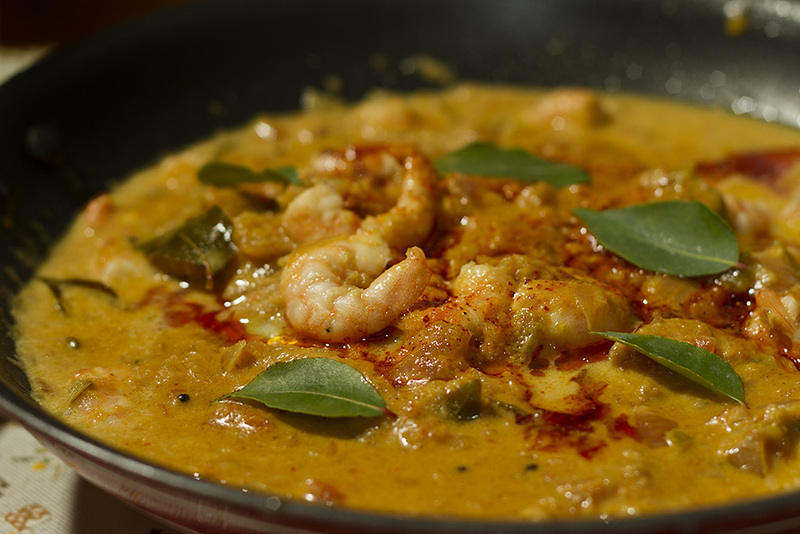 A fine balance of spice, tamarind, tomatoes and coconut makes this prawn curry absolutely a delight to make and eat. If you happen to like Indian food but can not eat spice, this curry is for you.If you like it hot, just increase the chilies. The prawns should be fresh, frozen prawns do not taste good with this curry. Shrimp and prawn are common names without the formal definition that scientific terms provide. They are terms of convenience with little circumscriptional significance, and do not represent actual taxa. A lot of confusion surrounds the scope of the term shrimp. Part of the confusion originates with the association of smallness. That creates problems with shrimp-like species that are not small. The expression “jumbo shrimp” can be viewed as an oxymoron, a problem that does not exist with the commercial designation “jumbo prawns”. The term shrimp originated around the 14th century with the Middle English shrimpe, akin to the Middle Low German schrempen, and meaning to contract or wrinkle; and the Old Norse skorpna, meaning to shrivel up. It is not clear where the term prawn originated, but early forms of the word surfaced in England in the early 15th century as prayne, praine and prane. According to the linguist Anatoly Liberman it is unclear how shrimp, in English, came to be associated with small. “No Germanic language associates the shrimp with its size… it remains unclear in what circumstances the name was applied to the crustacean. Onions 3 medium sized finely chopped. Heat oil in a pan and temper it with curry leaves, mustard seeds. Add tamarind paste, green chilies, ginger and garlic. Fry for a few seconds and tip in the finely chopped onions and fry them till they are golden. Add coriander powder and turmeric and fry for a second or so, and add to it tomatos and chicken stock. Add salt. Tip in the cleaned raw Prawns and cook till done. Prawns cook very fast and are considerded done when they appear pink. This takes about 3-4 minutes. Finally, just before serving, temper the curry with mustard seeds, a pinch of chilli powder and curry leaves. 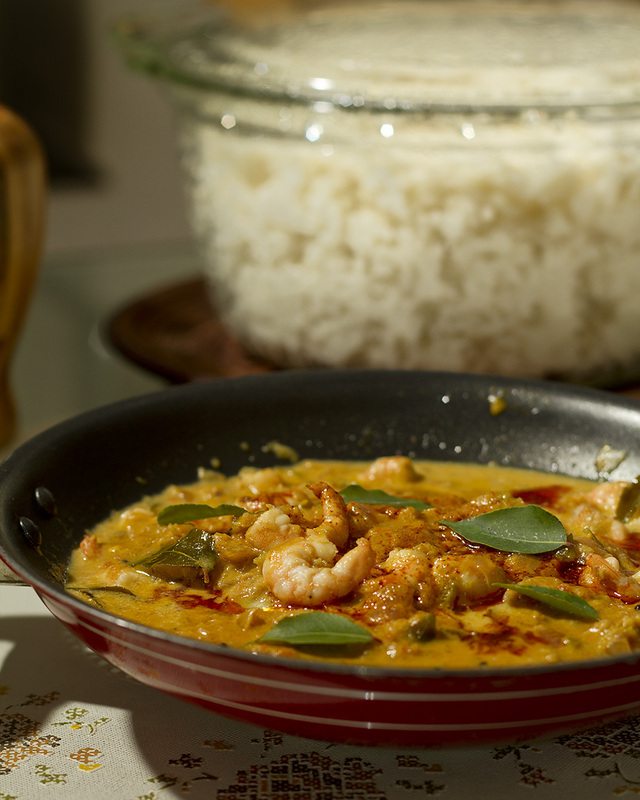 Serve the prawn curry with hot steamed rice.